For more than 80 years, the U.S. has celebrated Christopher Columbus with a federal holiday in his name. Columbus is celebrated for having discovered the Americas. But Columbus didn't "discover" anything. In fact, he dispossessed the native peoples already living in the Americas of their land, and laid the groundwork for centuries of ongoing Western colonization across the globe. The genocidal violence of Columbus is well attested to by his own journals, where he recounts unspeakable acts carried out by his forces against the indigenous population. In addition, Columbus has the bloody distinction of having inaugurated the transatlantic slave trade, which over subsequent centuries would result in the kidnapping and enslavement of millions of African people. Columbus is not a venerable hero. He is an odious conquistador. It is time to stop honoring him. From Los Angeles to Seattle, many U.S. cities have chosen to do what is just and renamed Columbus Day as Indigenous Peoples’ Day. Why is New York not among them? There is no reason for holding out any longer. It’s time for the Mayor and City Council to stand on the right side of history. 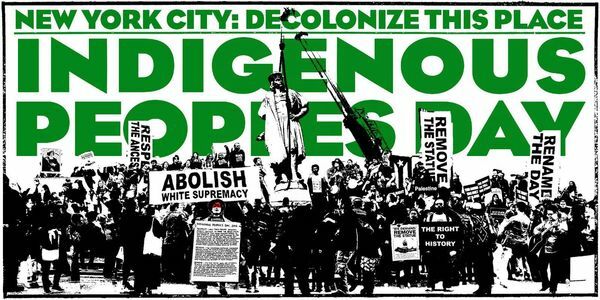 Please sign this petition to ask New York City Mayor Bill De Blasio to officially replace Columbus Day with Indigenous Peoples' Day. New York City sits on the territory of the Lenape people, which was expropriated from them by Dutch and British settler-colonists in the 17th century. Yet many thousands of Indigenous people from the New York region, the country, and across the Americas currently live in the city--more than any other in the United States. Let us honor the rich histories, moral claims, and ongoing presence of Indigenous people in this city, and reject the celebration of imperial conquest. This public holiday must be relaunched with a new ethical compass, one that acknowledges history and points towards a just future. We must no longer remain in the thrall of a figure widely associated with exploitation and enslavement. Please sign to ask New York City to acknowledge these injustices by creating Indigenous People's Day! This petition is being initiated by NYC Stands with Standing Rock, Decolonize This Place, Black Youth Project 100, Eagle and Condor Community House, and South Asian Solidarity Initiative. Please join us in an Anti-Columbus Day Tour at the American Museum of Natural History on Monday, October 9th, beginning at 3:30 PM. All are welcome to join the tour, tickets will be provided. Read our public letter here.